Mokuren Dojo: Where is the fulcrum on hizaguruma? Hint: It's not tori's foot or uke's knee. Consider this - even if you are the strongest dude on earth, it is not possible to balance yourself on one leg while holding uke's weight up at the end of your other leg. If your foot contact with uke's knee were the fulcrum, or axis of rotation, for hizaguruma then you would have to be able to stand on one leg and hold up uke's weight with your other foot (even if only momentarily). The fulcrum for hizaguruma is the same fulcrum as for sasae (no, it's not his ankle either). It is where his toes contact the ground. So, the goal of hizaguruma isn't to create a fulcrum with your foot and spin uke around it. 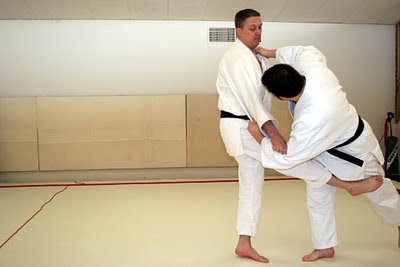 The goal is to stop uke's leg from moving forward long enough to advance his weight out over his foot so that his own foot becomes the fulcrum about which he continues to rotate. If you catch the right timing and direction then you can reach across and tap uke's knee with your foot just enough to stop it then remove your foot and catch your balance with it. If you can remove that foot during the throw, it's not the fulcrum. When I figured that one out it made hizaguruma SO MUCH EASIER for me!